As my wife and I were driving to Lowe’s the other day in my 2002 Prius, it suddenly started to shudder and run very rough. We weren’t but about a mile or two from home, so we immediately turned around and limped home. After we made it home, the car wouldn’t even start…it would simply shudder when starting was attempted. 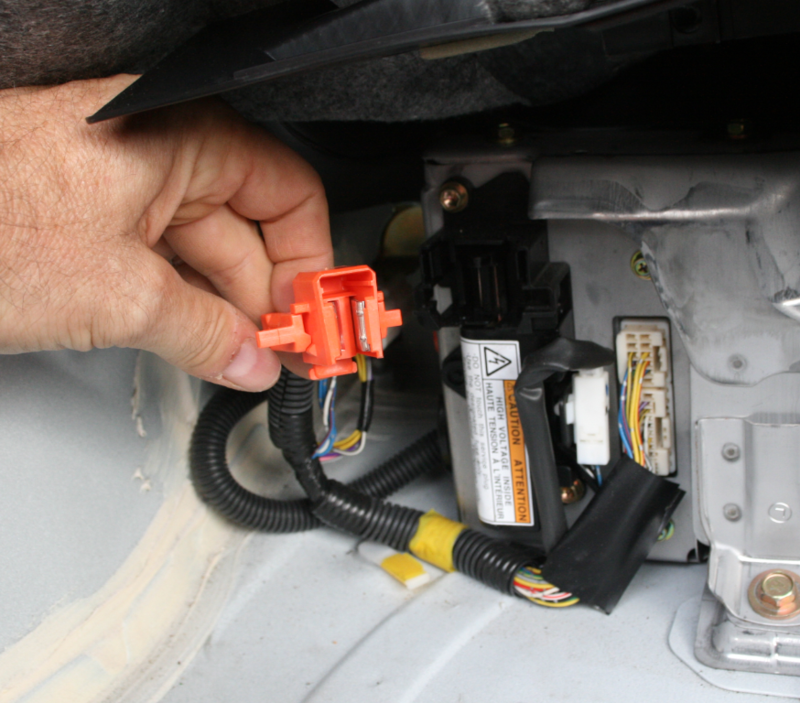 I went to the local Auto Zone and “borrowed” one of their code readers and found P3125 – Bad Inverter. A quick search on the internet and I found the price for a dealer replacement was about $4500. Ouch! So we hauled it back and I finally got a round-tuit yesterday. Since I couldn’t find a good procedure that anyone had documented online, I decided I’d document it and take a few pics along the way. Here’s my result. Disclaimer: I R an electrical engineer, so I am comfortable working around electricity. If you aren’t, perhaps you should befriend someone who is. Engineers need friends, too! Also, anywhere there were big orange HV cables I always checked the voltage between all connections with my meter before touching anything with a wrench. 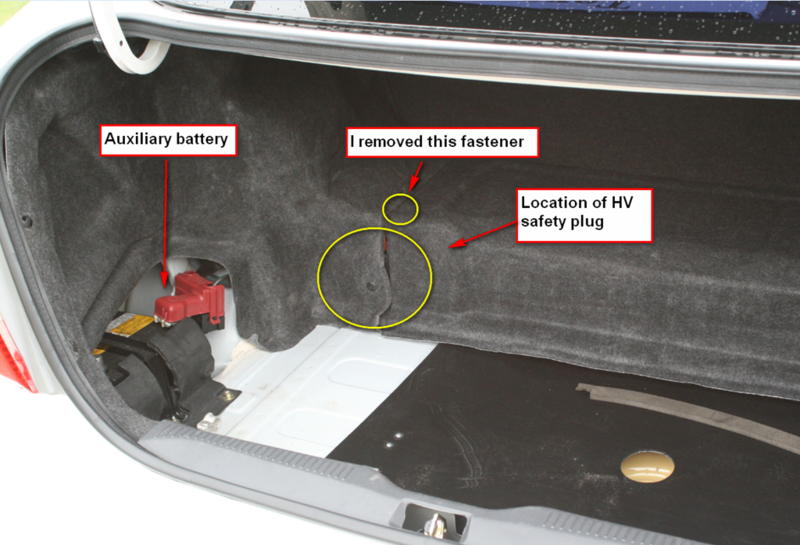 Before you start working on this car where you’ll be dealing with the high voltage (HV), you need to disable all the power and let it sit a few minutes to insure all the HV capacitors have had time to bleed down. I’ve heard many time tables on this, such as “let it sit an hour,” but the Toyota dismantling manual states five minutes, so I figured by the time I got to working on that part plenty of time would have passed. 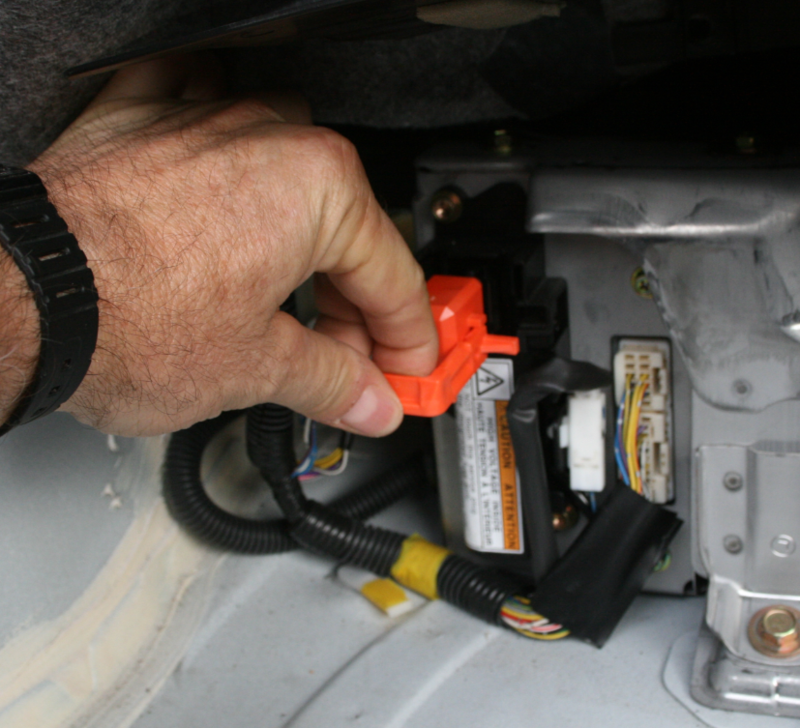 First, disconnect the 12v “auxiliary” battery (located in the trunk) and pull the safety plug on the high voltage. I disconnected the ground (-) battery cable. Here are a few pics in the trunk showing the location of each. Pull the lever down to unlock the safety plug. Me pulling out the HV safety plug. Hmmm, perhaps I should’ve worn insulating gloves (and a bunny suit). Now drain the inverter coolant. 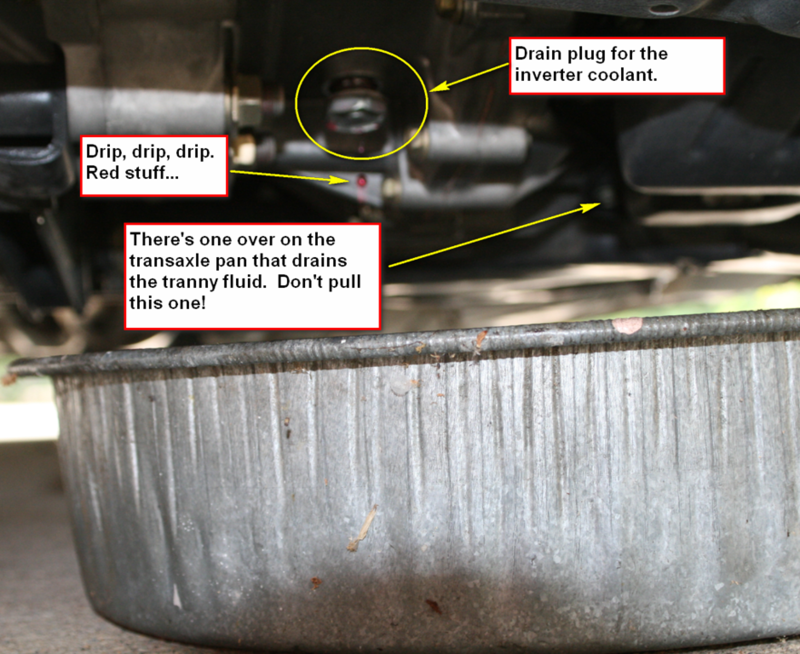 It’s kinda’ scary because you might think you are going to drain the transmission fluid. Oh, wait! You will if you remove the wrong plug! Don’t do that! There are others that have much better photos of this. Check out YouTube. 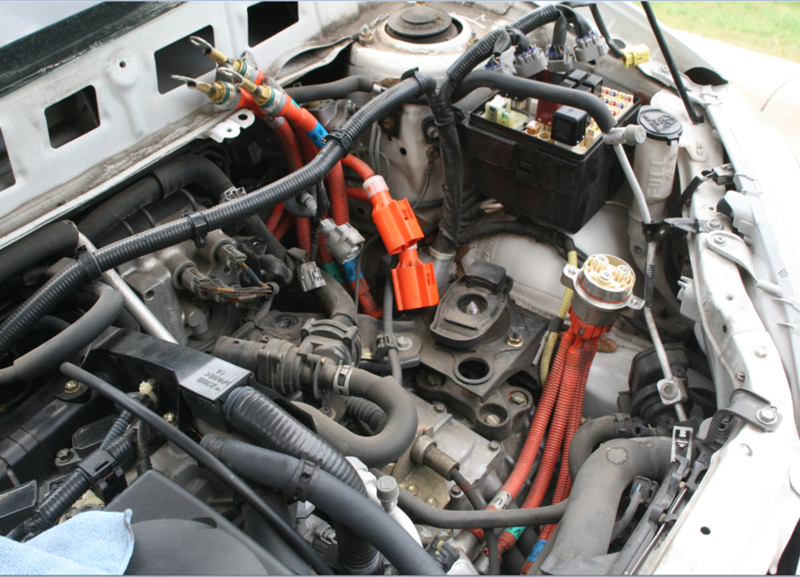 Now you can remove the hoses to the inverter cooling system. As I started this process, I did things in the wrong order (of course) and found there were a couple of bolts I couldn’t get to. I sent a text to the nice folks at Luscious Garage asking how I get to the bolts and they texted back (amazingly!) to remove the windshield wiper cowl. Duh! Should’ve done that at the very beginning. My loss is your gain! 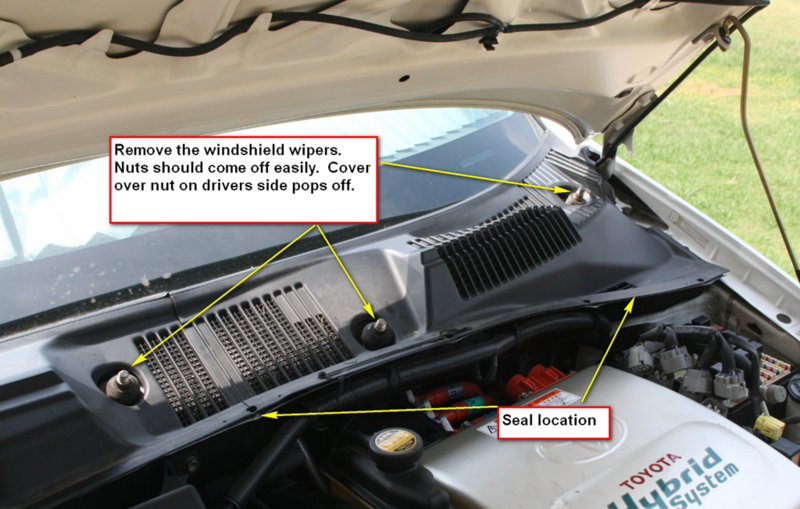 The windshield wipers are held on with nuts that should be pretty easy to remove. 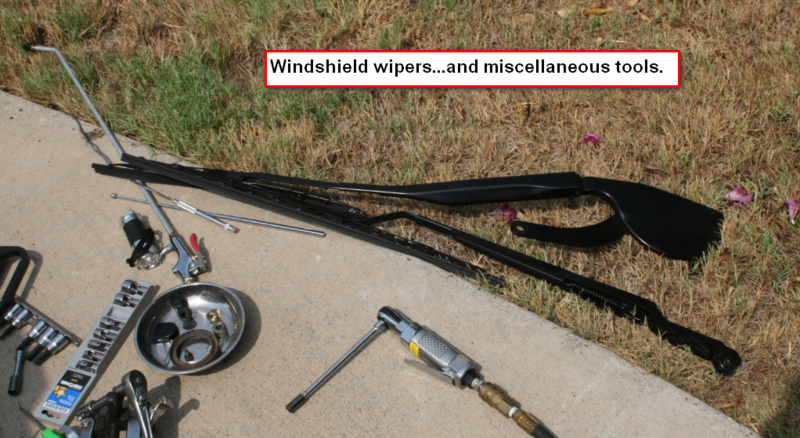 After the nuts are off, remove tension on the windshield wipers by pulling them away from the glass and see if you can’t easily remove them from the shafts. 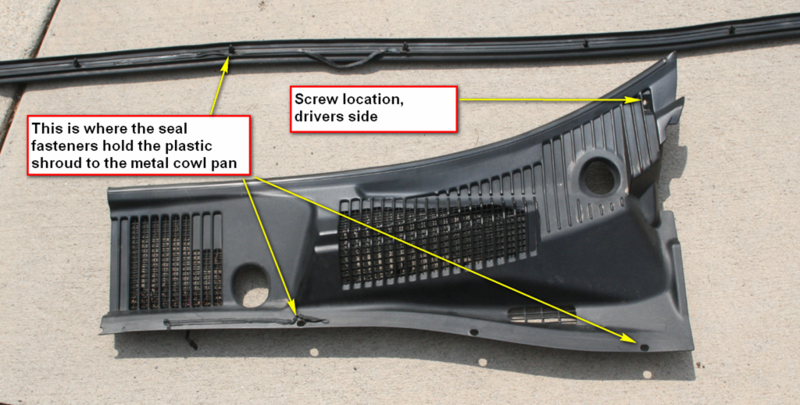 The cover is essentially held on with two phillips screws (one on either side) and the fasteners that snap in the rubber seal. 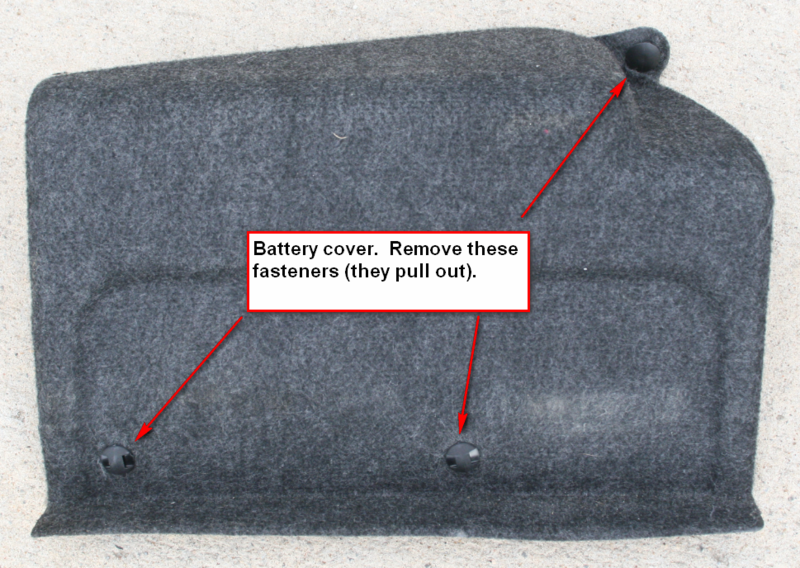 You do have to remove both sides of the cowl cover. 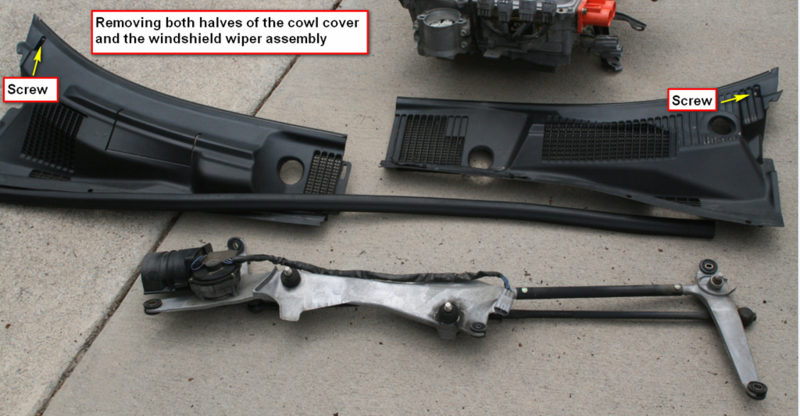 Once you get all this windshield wiper stuff out of the way, you can remove the cowl pan it sits in. I didn’t get a picture of this for some unknown reason, but it’s pretty easy. It just takes 5 or 6 bolts and you lift it out. Be careful not to cut yourself (I did) on the sharp edges. Once you get the connectors out of the way you can get to the two gray connectors on the back and have easier access to the HV cable connectors (which can be somewhat difficult to wiggle loose, but be patient). 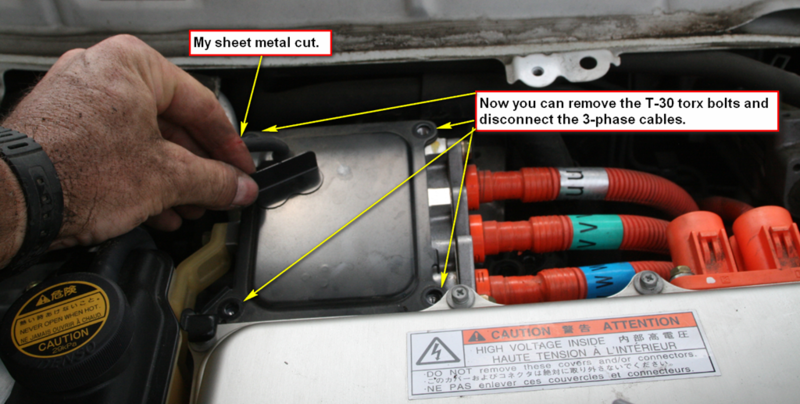 This entry was posted on September 18, 2011 at 1:26 pm	and is filed under Auto Repair, Instructions. You can follow any responses to this entry through the RSS 2.0 feed. You can leave a response, or trackback from your own site. can the old inverter be recycled? Not sure. I was wanting to find a place that could test it and possibly repair it…reasonably, of course! we followed your instructions to the letter and then did it backward when we put the new one in and now the car won’t even turn over. 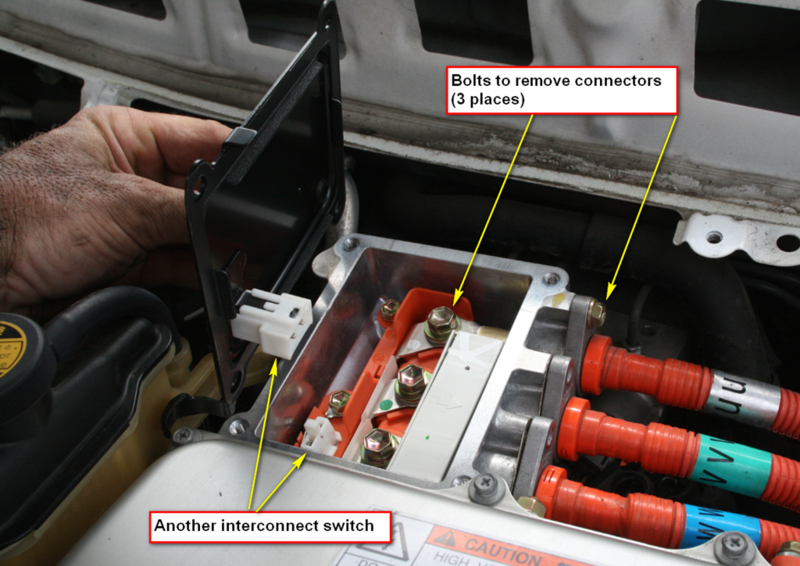 Electrics in the car work but nothing happens under the hood. any ideas? Mine turned out to need a new traction battery. 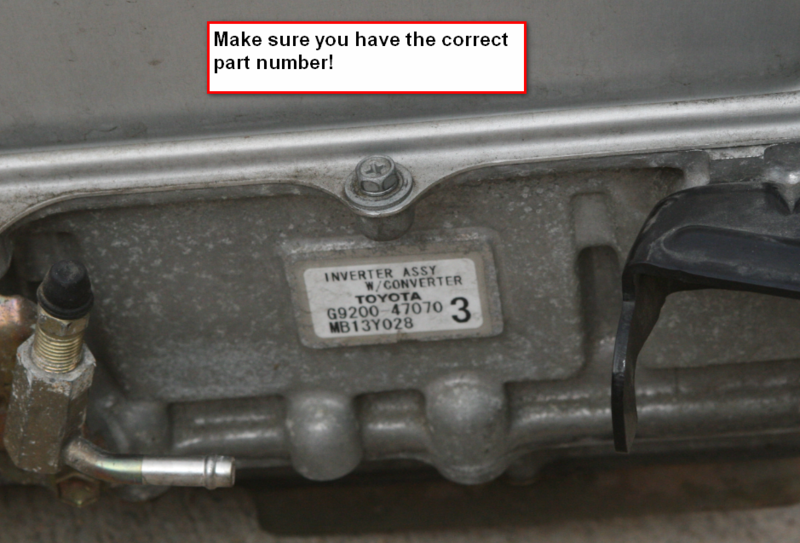 I have the P3125 code on my 2001 and looking to replace the inverter myself. 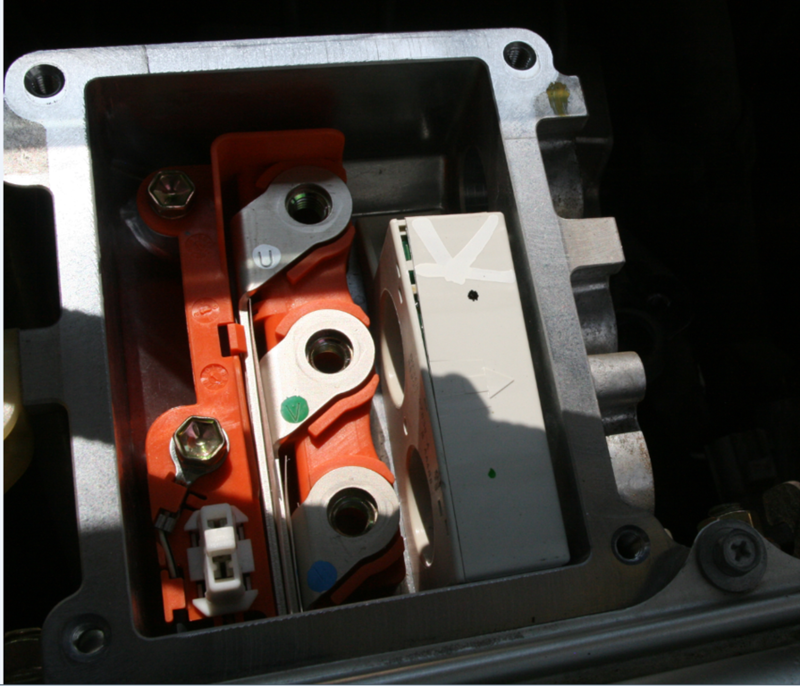 Already work with high voltage, have repaired wire harness problems in the traction battery pack, big hand problem with accelerator, and others. 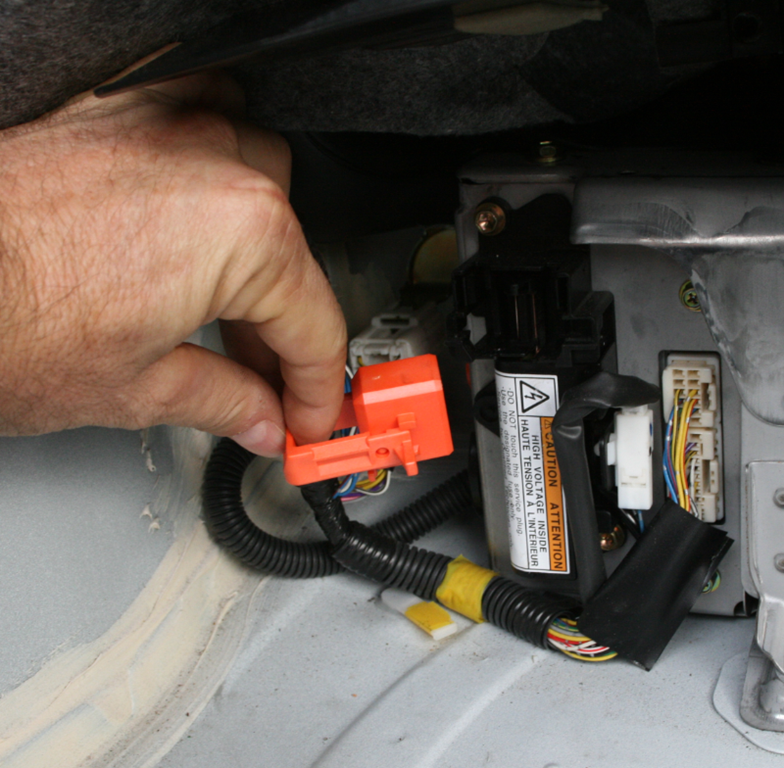 1) Looks like you replaced both the traction battery and inverter. Were they both bad at the same time? Or was only the battery the problem in the first place? 2) Is there a good source of reliable inverters you know of? 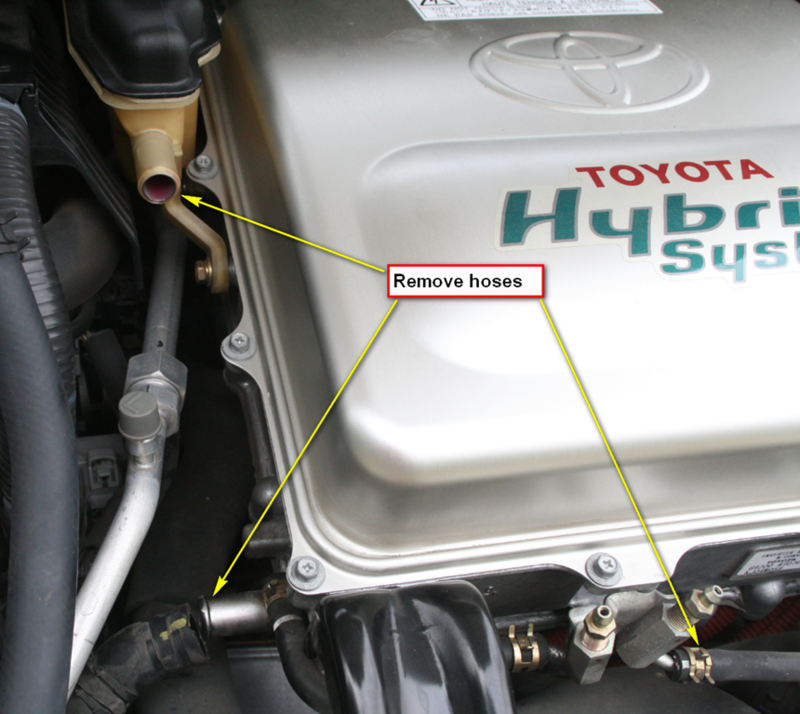 3) Toyota and non-Toyo mechanics keep saying don’t do it yourself because you have to re-program the system after the exchange. Was this true for you? I believe I replaced the inverter (purchased it off eBay from a salvage yard) and really didn’t need to. However, I don’t have a way to test the inverter I removed. I think my problem was simply the battery. You don’t have to reprogram anything. It figures everthing out in a few hours of operation and all has been well for the last 6K miles. If anyone knows of a place that will test an inverter, let me know! It started fine after replacing the inverter. However, I think my probably was really batteries because in a couple of days I got another code which indicated batteries. I ordered a rebuilt from Involt, replaced it, and it’s been working fine for over 6K miles. 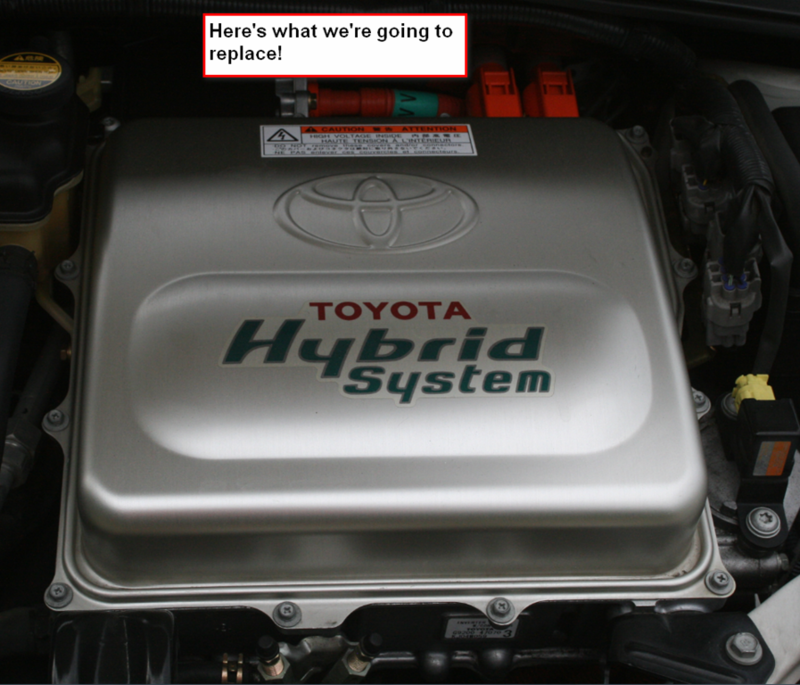 I had to have my inverter replaced in my 2010 prius… it was under warranty, luckily…. but… I have noticed that my gas mileage has been affected greatly… use to get about 48-50 mpg and now am getting about 43-44… anyone else experience this problem? Thanks! Do the part #s vary among the different model years in each generation or just among the generations? I think there are a couple of part numbers in the first generation Prii…you need to be careful, as I don’t know if they are interchangeable. 1st gen definitely different than 2nd gen. I have a 2001 that got a P3125 on a hot day and now does not even attempt to turn over the engine, and I just got a an entire donor vehicle that’s been rolled with a good battery and inverter. If any of you that posted previously still have inverters, I would like to attempt to devise some sort of inverter test process, or at least have some to take apart and reverse engineer them, so please let me know if you have one that’s failed. 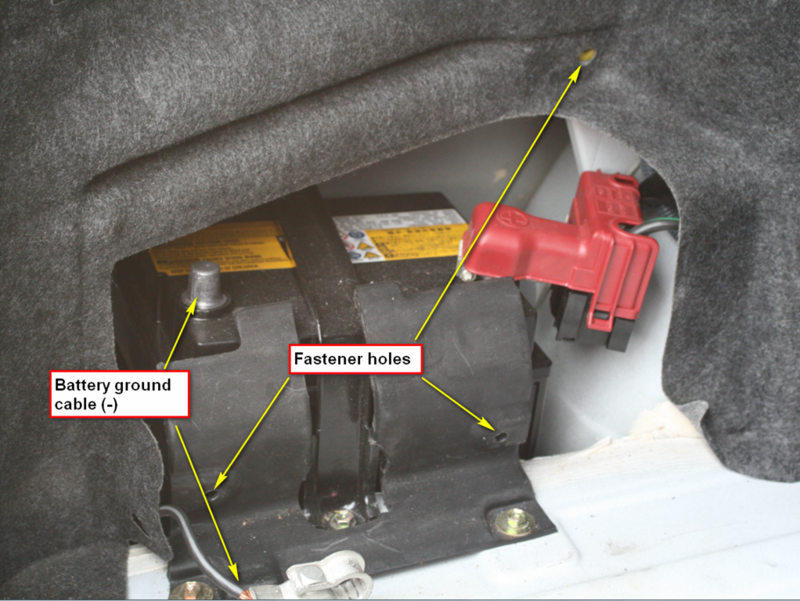 I would like to know if there is a place that can test/repair the inverter. It seems like a much better solution. 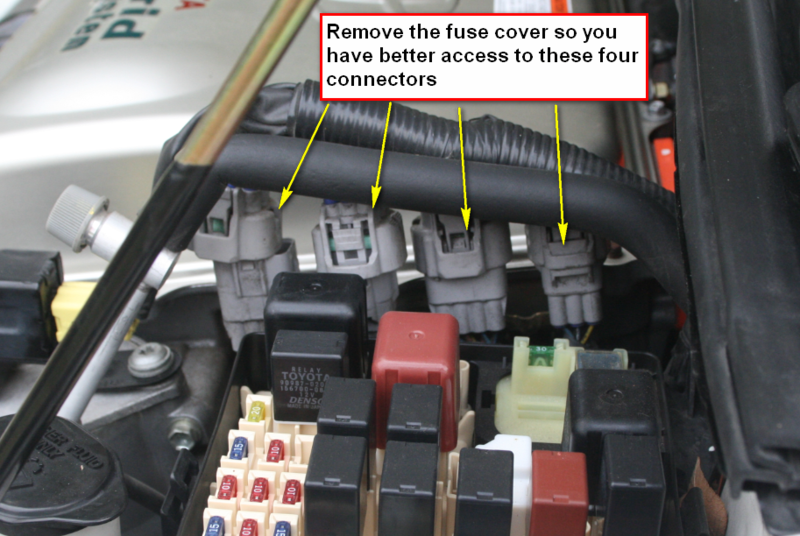 iS IT A GOOD IDEA TO REPLACE THE ELECTRIC PUMP FOR THE INVERTER WHILE THE UNIT IS OUT? I have mixed emotions about replacing items that are working. 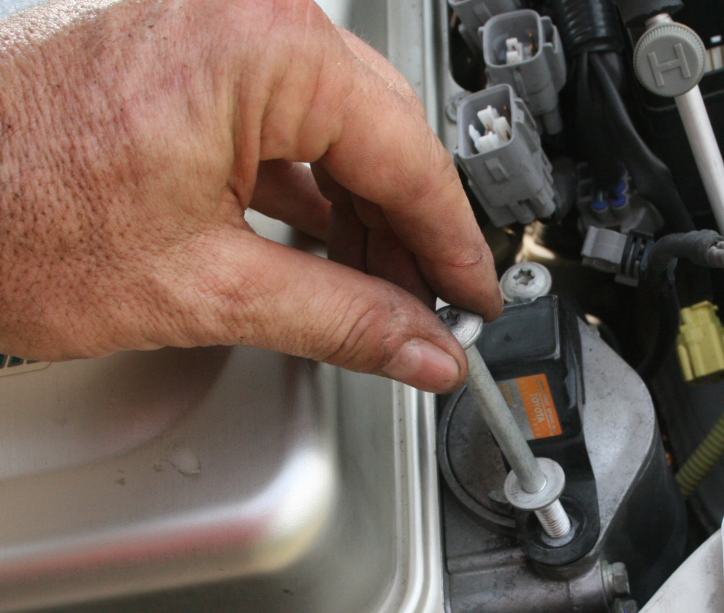 Replacing the pump is not horrible, but it does take some work to bleed it. 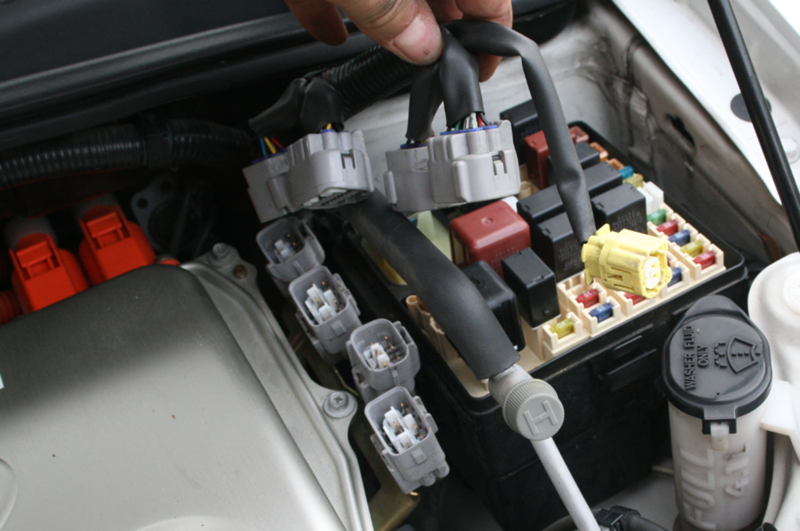 On the flip side, many would argue that you don’t want an failed pump to allow your inverter to overheat so, if it’s getting old, it might be the right thing to do. I’m convinced there are not many dealers who know how to work on these. They are old and not enough of them for the dealers to worry about. Was looking through your blog (looks like we’ll be trying to perform this replacement soon) and it looks like there’s an issue loading the page beyond where you’ve fully removed the old inverter. Is that intentional? It says “Loading…” below that picture, but it doesn’t appear to actually load anything and the page doesn’t indicate that it’s still loading anything. Thanks much! This blog post looks like it’ll be really helpful! Thanks, Russell, it’s still showing the same thing on a few different browsers. First thanks for the great info.Looks like you you changed the inverter on your prius back in 2012, is the car still running now? How much mileage was on the salvaged inverter? How much mileage was on your prius at the time of repair? 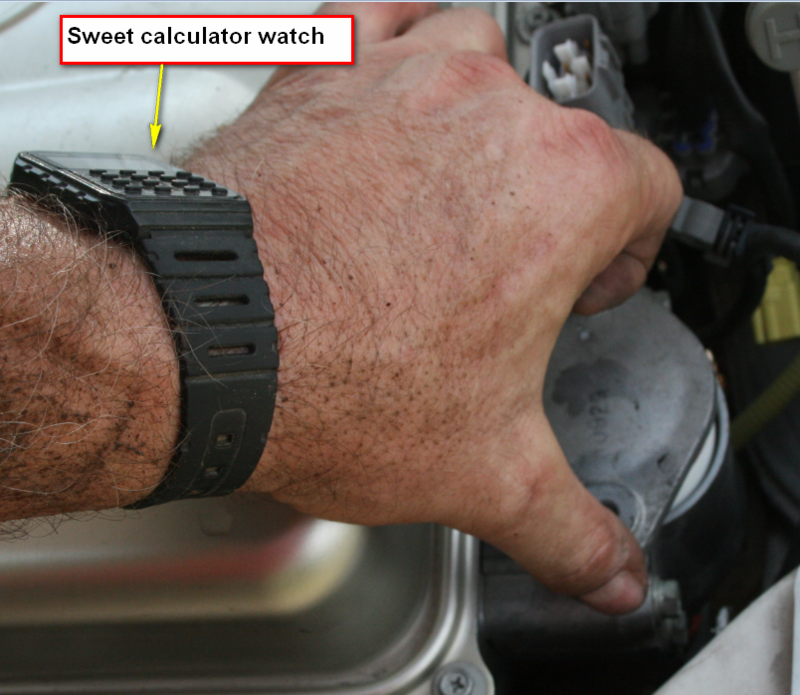 How much mileage did you get after the repair? 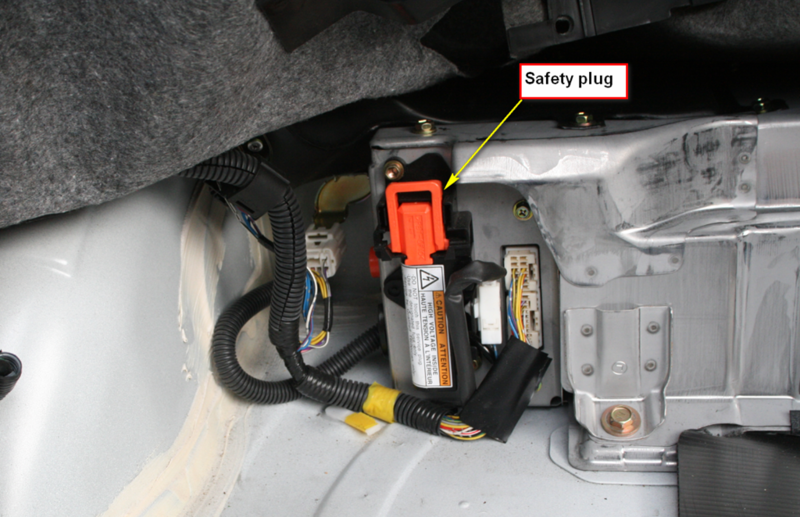 I recently had the 12v and hybrid battery replaced on my 2002 Prius and it still won’t start. DId the whole diagnostic with a dealership and they told me $3,900 minus the $108 diagnostic. I’m trying to decide if a salvaged or refurbished inverter is better. I have 185,000 miles on my Prius I’ve only had it for a year i paid $3200 for it and I would like to get a least 4 more years out of it before I decide to buy a newer Prius. Still running fine. I’ve probably put 30-40K miles on it so far. 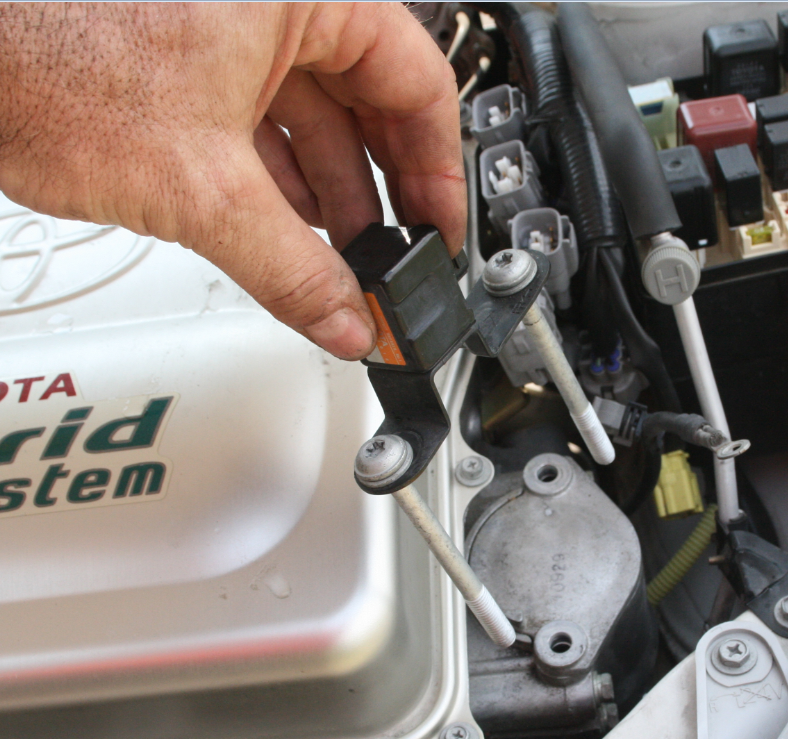 Just replaced the 12V battery with an Optima after over 12 years on the original. Not sure I needed the inverter or not, but I still have it. You should be able to get 200-300K out of your Prius. Is there any instrctions for inserting the replacement inverter. the steps stop with the last pic of the hood with an empty space where the inverter goes. How do you put it in? Where are those photos and instructions? 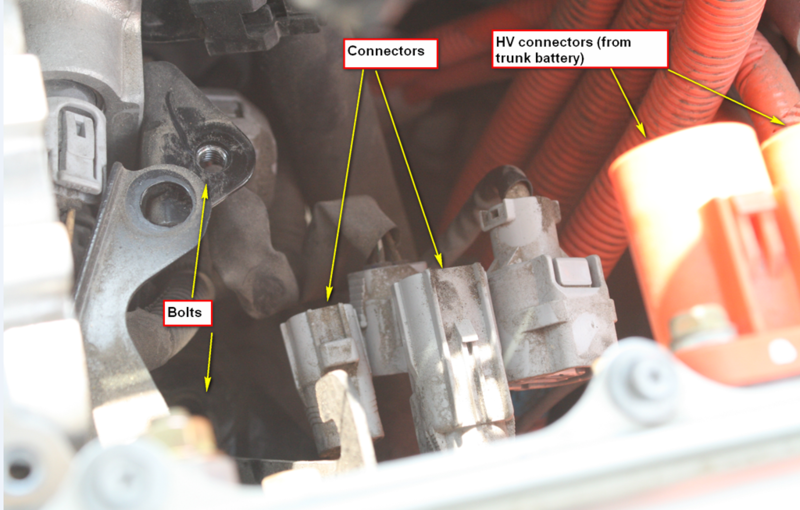 has anyone with the “inverter problem” tried to just replace the 12 v battery and see if it worked to resolve the problem? 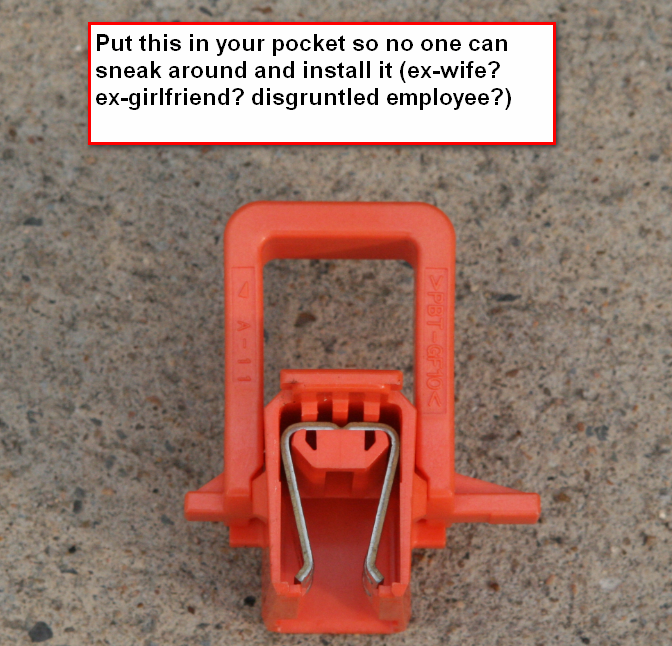 If so, did it work or not? Russell, will be making the attempt. My wife bought her 2003 new. She currently has about 250K on it. She has decided that I will fix the car so she can get another 50K+. Let you know how it goes. Fpllowed the instructions and it was easy to change the inverter. I am now faced with a different issue. The ADD FUEL warning is now on and the engine will not start. I can hear the inverter working, but no power to engine. 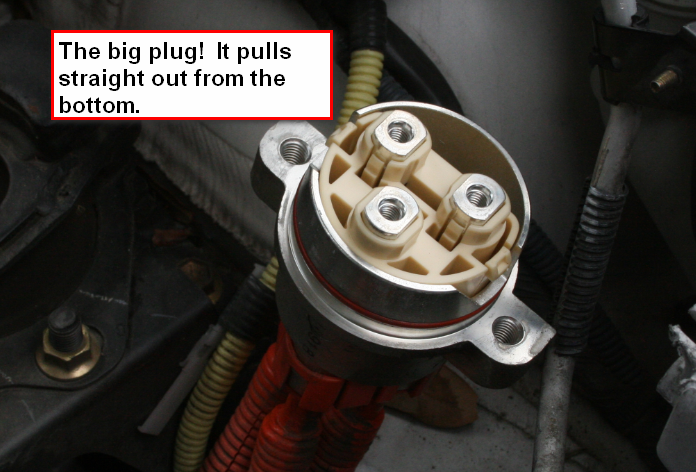 I switched out the fuel pump relay but that didn’t seem to have any affect. Do you have any recommendation on what the problem would be. I had the batteries replaced about 2 years ago and I am at a loss for what it might be. 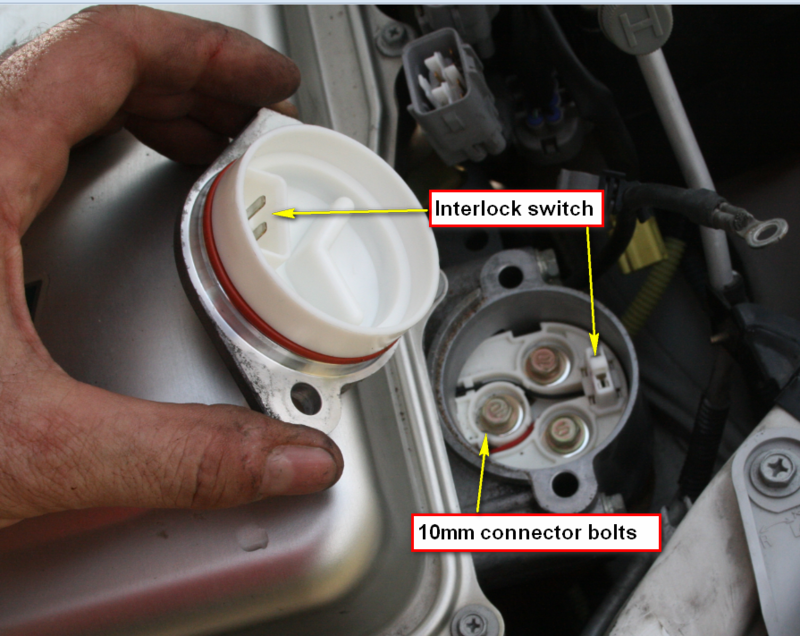 Is it possible to change the coolant reservoir (attached to the inverter) without going through your process? I am working on 2008 Prius base. Thanks for the great instructions above. Not sure. If you don’t get air in the system, you might be able to forego the purging. Perhaps with some good tube clamps to prevent any air from getting in? Question for everyone with inverter problems. Did the car run at all once the three codes came on? My car starts and runs but it is still putting up the code and 3 warning lights. 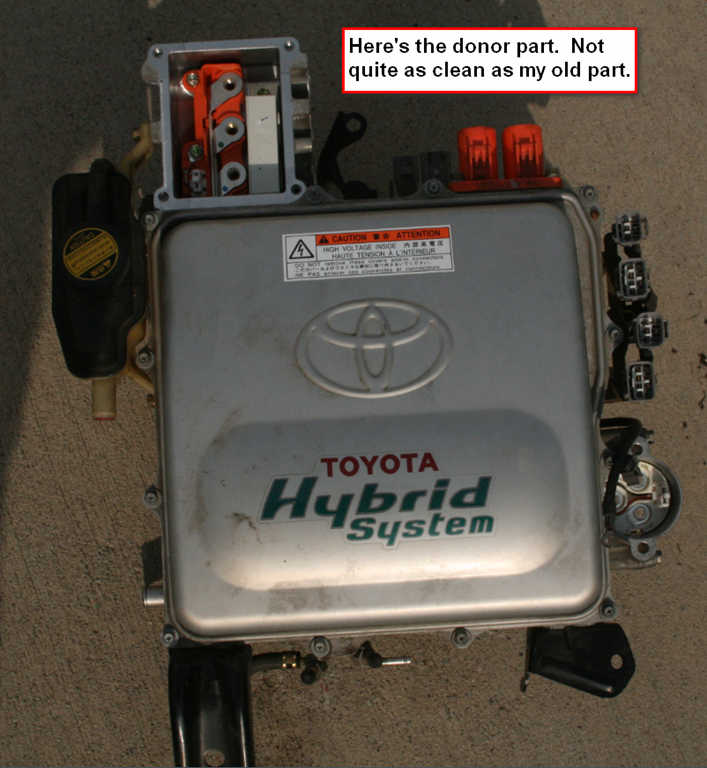 Hi, I replaced the inverter in the 2005 prius with a salvage part. 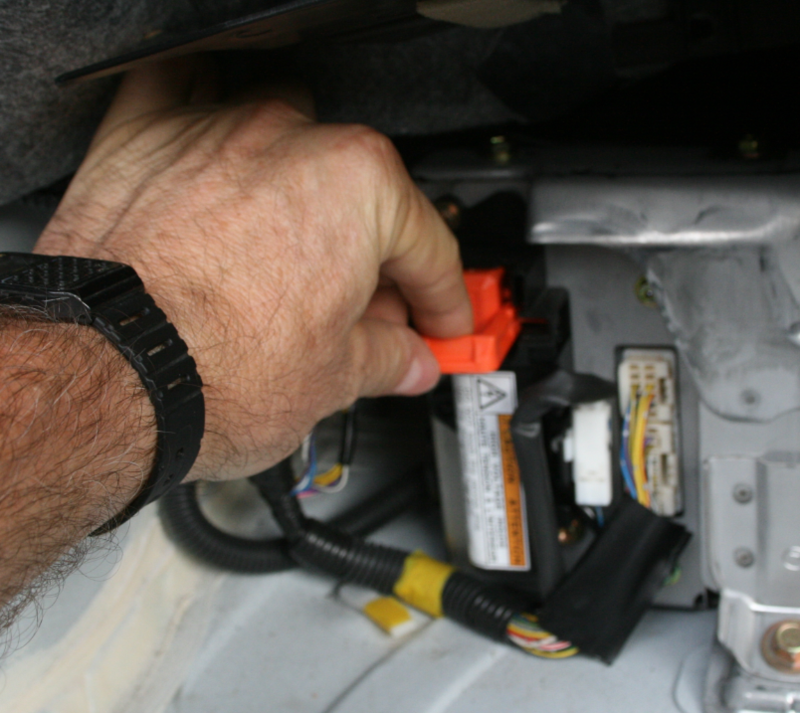 Once I put the new inverter in the car would not start. 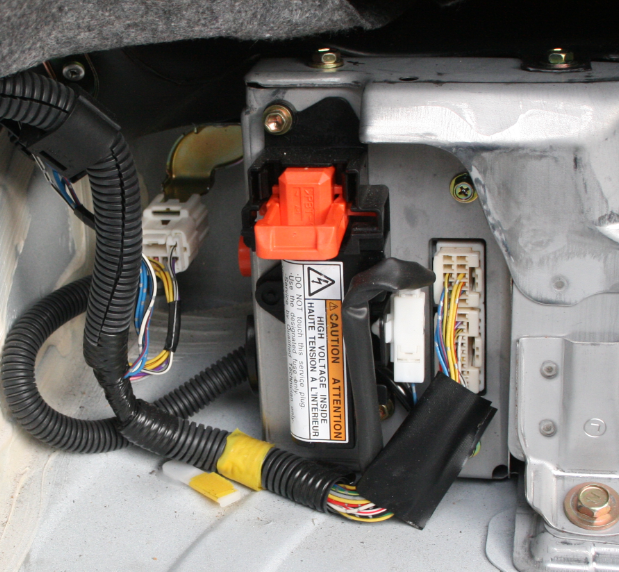 I then replaced the inverter with the orginal unit, and it will not start. This seems to be some prodcedure I am missing? 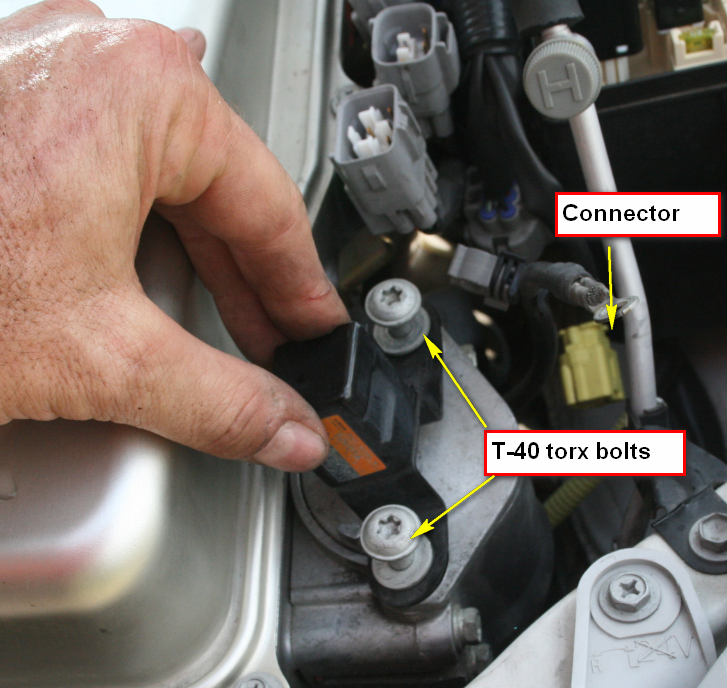 I am using an installation guide from Toyota I found online. Any help would be great! No longer have the car, Patrick! Sold it with 150,000 miles on it and it was going strong. While grateful for his contribution I’m concerned bad results and no responses in lasts two years. 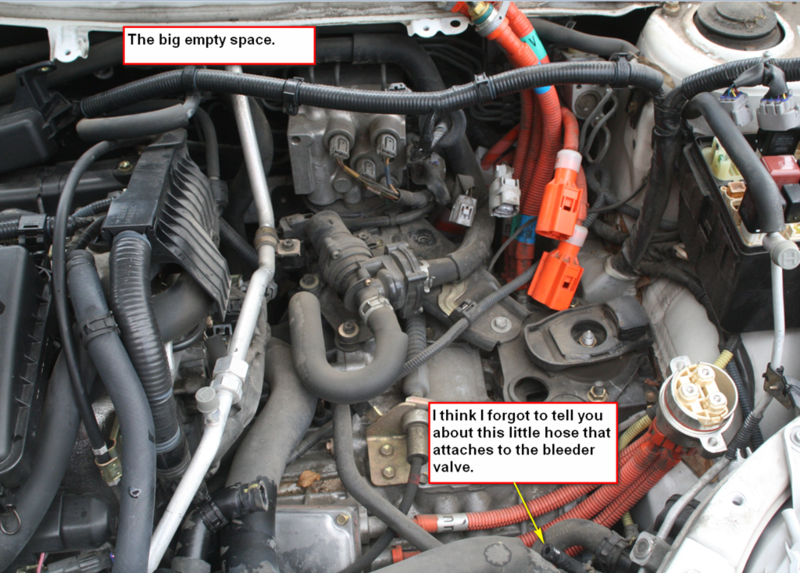 I need to do this procedure too but the no, etc of people saying they did it and now their car won’t start is worrying. I sold the car in 2016 with 150,000 miles on it and it was going strong. I’m concerned that the original issue may have not been the inverter, but simply the traction battery. In retrospect, I’d probably take out the traction battery and test the cells to see if there were any bad ones prior to replacing the inverter.